The time has come to get rid of the old messenger bag. 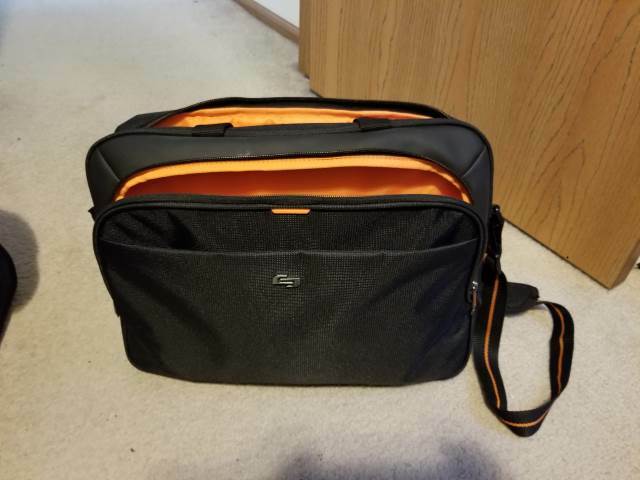 Today, I give the review of the new replacement messenger bag. 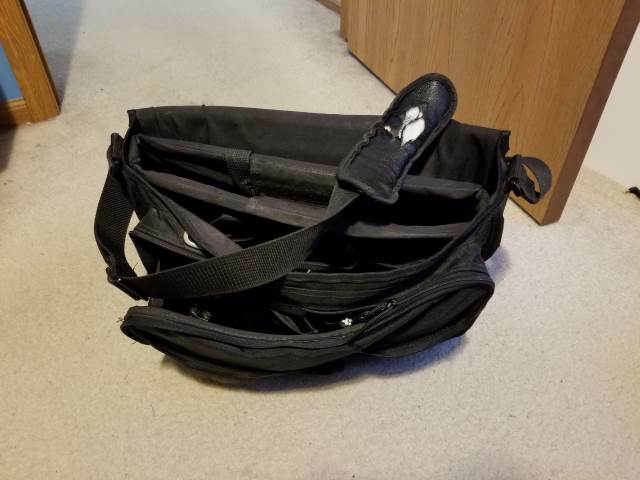 I've had my Solo Messenger bag for 12 years and it's held up wonderfully until this weekend. The handle is starting to fall apart and some pockets are slowly ripping. I thought it was 10 years until a couple of my friends reminded me I had it when we were consulting back in 2007. So yeah, it was time for a new messenger bag. I went to the local computer store (MicroCenter) and tried out a couple. I kept an open-mind as well to even try the backpacks. Swissgear. Gator. Kensington. All of the names were there. After going through every messenger bag (and a couple backpacks), I landed on one that didn't have a tag on it, so I put it aside in my personal stack to evaluate later. I would look over other bags and add them to my personal pile, but there weren't many. When I finally made my decision, I went with the "no-tag messenger bag." I turned the corner to look at the other rack expecting different carrying bags, but found another section of similar backpacks. However, I did notice a small messenger bag buried under the backpacks. Someone must've tossed it over there when they found the right backpack. It was the same messenger bag I was carrying, but this one HAD a tag. Can you guess what the tag read? I wasn't even trying to look for Solo carrying bags, but even without a tag, it fit my requirements perfectly. As you can imagine, I bought it. As I mentioned in my Top Travel Gear for Developers, I carry a lot of gear with me (hey...I was a boy scout!). The old messenger bag could carry a lot of equipment and gadgets. But lately, gadgets are getting smaller and not requiring a lot of space. I've taken my current inventory of gadgets in "old yeller" and seriously evaluated whether I needed them or they need replaced. It was time to get rid of the old Solo Messenger Bag. The new Solo Urban Messenger Bag is definitely thinner than the old one, but maybe I stuffed the old one a little too much when I shouldn't have. It's 13.5" high x 17" long x 2.5" wide. The wide part is what attracted me to it. Not quite 3", but is thin enough for small items and a laptop. It has a neoprene, sturdy body with hard-to-break zippers. I do like the front-side zipper organizer to store folders and papers when you need to access them quickly. As with the old, there is a fair amount of pockets on the inside with hidden pockets to hide items such as portable hard drives and thin, chargeable batteries. 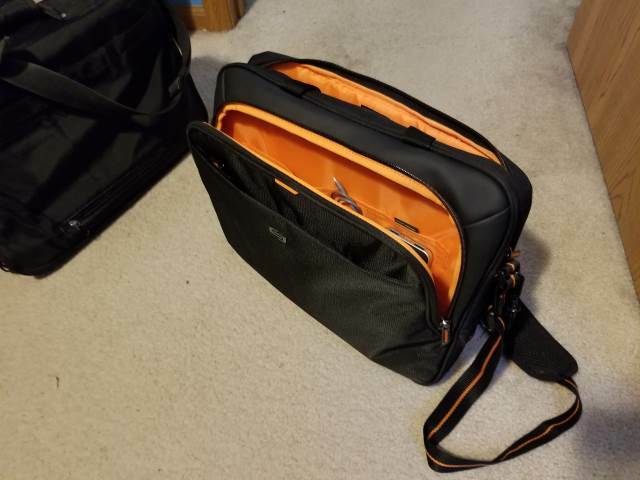 The adjustable shoulder strap makes it feel comfortable when hauling it around, but honestly, even with the laptop, it doesn't weigh me down like the old Solo Messenger Bag. The two carrying handles makes it easy to ditch the shoulder strap and allow you to become more flexible holding it closer to you than having it swing around on your shoulder. So far, I haven't had any real problems with the Solo Urban Messenger Bag. We're still early in the game, but I'm liking it. If you're listening, Solo (feel like I'm talking to Han Solo), I'll have to be honest. The orange trim didn't thrill me. This was one of the downsides when I bought this. Even with businessmen (or developers), the orange doesn't "blend." Another thing is the zippers. The zipper-pull had a hole near the end when you grab them. On this new model, the holes are near the top of the zipper-pull. I always hung different types of accessories off of the zipper holes. These features aren't on the new Solo Messenger bag. Currently, I'm quite satisfied with my purchase. Solo always upholds their reputation with their gear. As you can tell, I'm sold on Solo. Funny enough, I'm not the only one who likes Solo's messenger bags. Consumers on Amazon are giving the Solo Urban Laptop Messenger Bag 92 reviews with an average of 4.2 stars at the time of this writing. I've always liked their messenger bags and look forward to their next line of Messenger Bags for Developers (which, BTW, would be awe-some!). How do you carry around your laptop? Do you use Solo? What brand do you use? Post your comments below and let's discuss.